Objective: To examine the association between routine childhood vaccinations and survival among infants in Guinea-Bissau. Participants: 15 351 women and their children born during 1990 and 1996. Main outcome measures: Infant mortality over six months (between age 0-6 months and 7-13 months for BCG, diphtheria, tetanus, and pertussis, and polio vaccines and between 7-13 months and 14-20 months for measles vaccine). 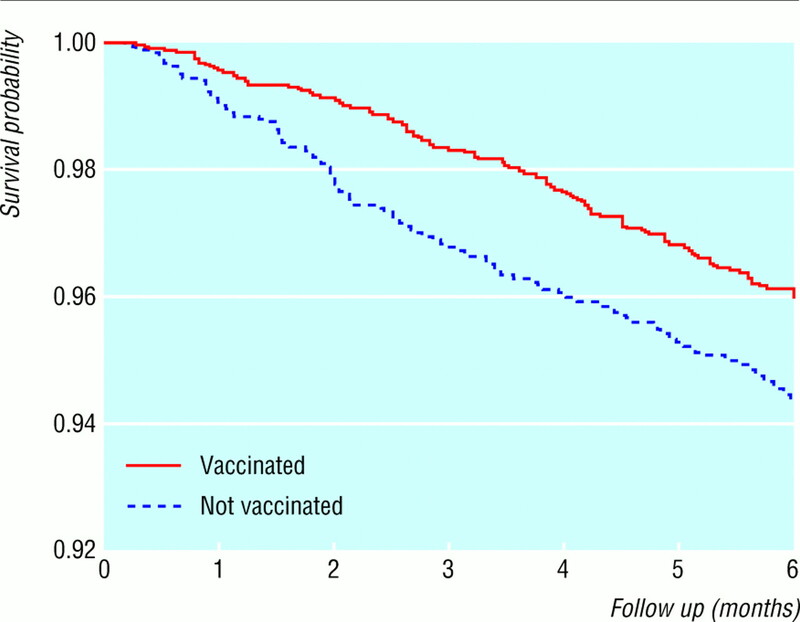 Results: Mortality was lower in the group vaccinated with any vaccine compared with those not vaccinated, the mortality ratio being 0.74 (95% confidence interval 0.53 to 1.03). After cluster, age, and other vaccines were adjusted for, BCG was associated with significantly lower mortality (0.55 (0.36 to 0.85)). However, recipients of one dose of diphtheria, tetanus, and pertussis or polio vaccines had higher mortality than children who had received none of these vaccines (1.84 (1.10 to 3.10) for diphtheria, tetanus, and pertussis). Recipients of measles vaccine had a mortality ratio of 0.48 (0.27 to 0.87). When deaths from measles were excluded from the analysis the mortality ratio was 0.51 (0.28 to 0.95). Estimates were unchanged by controls for background factors. Conclusions: These trends are unlikely to be explained exclusively by selection biases since different vaccines were associated with opposite tendencies. Measles and BCG vaccines may have beneficial effects in addition to protection against measles and tuberculosis. Measles vaccine is strongly associated with better childhood survival in developing countries. 1 2 Since this effect cannot be explained by the specific prevention of measles, 1 3 4 standard measles vaccine may be associated with a non-specific beneficial activation of the immune system.1 This effect would be observed only in areas with high mortality.5 Similar studies of BCG, polio, and diphtheria, tetanus, and pertussis vaccines have not been carried out in countries with a high mortality. Worldwide, BCG is the most widely used vaccine and has been recommended for tuberculosis control in developing countries for more than 40 years. The protection provided by BCG is controversial as it has variable efficacy in different settings. 6 7 Routine vaccinations with diphtheria, tetanus, and pertussis vaccine and polio vaccine provide good protection against the specific diseases. The recommended schedule is based on studies of seroconversion and protection and on assumed feasibility of the schedule.8 The effect of these vaccines has been assumed to be proportionate to the impact of the specific infections. Guinea-Bissau in West Africa is one of the world's poorest countries. It has the sixth highest childhood mortality according to Unicef estimates.9 Since the early 1990s we have followed a representative cohort of 10 000 mothers and their children from the rural areas of Guinea-Bissau. Because the survival of recipients of routine vaccines has not been investigated in areas with high mortality, we examined the association between vaccination and survival in rural Guinea-Bissau. A longitudinal study of women of fertile age and their prospectively registered offspring was initiated in 1990 in the five most populous regions of Guinea-Bissau. The study was set up to assess mortality, including perinatal, childhood, and maternal mortality,10 and to monitor the use of health services. In each region, 20 clusters of 100 women were selected by the method recommended by the Expanded Programme on Immunisation for surveys of immunisation coverage. The children were followed to death, migration, or the age of 5 years; there was no loss to follow up because it was always possible to get information on all children from relatives living in the same compound. Data were collected by a mobile team of five to six assistants from the Bandim Health Project. The vaccination schedule recommended in Guinea-Bissau is BCG and polio at birth; diphtheria, tetanus, and pertussis and polio at 6, 10, and 14 weeks; and measles at 9 months of age. At each visit, vaccination status was determined by inspection of the immunisation card. Children who had no date on their card or who were declared to have received no vaccination were considered unvaccinated. We excluded children whose cards could not be inspected because the mother was absent or the card could not be found. Since we could not advise communities about the team's visit, many mothers were away on the day of the visit. Most mothers in rural Guinea-Bissau keep their children's vaccination cards with their personal belongings locked in a trunk. Hence, if the mother was not present, the vaccination card could not be seen. We estimated the effect of vaccinations by analysing mortality according to the vaccination status assessed at the initial visit. Information on deaths was obtained at the subsequent visit, and therefore children had to be visited twice to be included in the study. Intervals between visits were mostly 5 to 7 months but could be longer for logistic reasons, particularly because of inaccessibility during the rainy season. To minimise variability in length of follow up, mortality was assessed between the initial visit and the date of the following visit or six months later, if the following visit occurred more than six months later. As children were 0-6 months old when first seen, the impact of BCG, polio, and diphtheria, tetanus, and pertussis vaccines was assessed between the initial visit and the following visit or six months later. Survival over a longer follow up period would be confounded increasingly by the effect of measles vaccine. We calculated estimates separately for recipients of polio and diphtheria, tetanus, and pertussis vaccines, but these were virtually identical as the two vaccines are always administered together. The effect of measles vaccine was examined between the second visit at 7-13 months of age and the subsequent visit or six months later. To estimate the mortality ratio for vaccinated and unvaccinated children, we used a Cox proportional hazards model,14 taking length of follow up into consideration and adjusting by stratification for age, period, season, and cluster. By stratifying for cluster we also controlled for differences between the five regions; in fact, we compared survival for vaccinated and unvaccinated children in the same village. Vaccination coverage has changed over time as have death rates, and control for period was therefore important. Since most vaccines are given in campaigns during the dry season from November to June, and mortality is higher in the rainy season, it was also essential to control for season. Neither season nor period affected the estimates of mortality associated with vaccination, and the results are therefore not reported here (data available on request). Other background factors were controlled for in the same Cox model. Mortality differences between vaccinated and unvaccinated children were also estimated with other statistical models, but the results were essentially the same (data available on request). Between February 1990 and April 1996, we registered 15 351 women of fertile age and 11 460 pregnancies; 392 women moved before giving birth. The 11 068 pregnancies resulted in 333 abortions, and 437 stillbirths. This left 10 298 children, of whom 686 died, 90 moved before the first visit, and 770 were too young to have received two visits and could therefore not be included in the survival analysis. The remaining 8752 children were alive at the first visit and their survival ascertained at the second visit; 8104 were under 7 months old when first seen. Of the 8752 children, 429 died and 214 moved between the first and second visit, and 752 had no third visit before the end of the study, leaving 7357 children to be followed between the second and third visit. Of the 7357 children, 323 died and 183 moved before the third visit. At the first visit, 5754 (66%) had their vaccination card inspected; 2981 (34%) were absent and 17 (0.2%) had lost their card. Eight per cent of the children received BCG within the first two days of life and 50% (3388/6771) within the first month, the median age of vaccination being 31 days. The median age for first diphtheria, tetanus, and pertussis dose was 87 days. Of the 8104 children aged 0-6 months, 5274 had a vaccination card examined or had had no card; 63% (3301/5274) were vaccinated with BCG. Of the 2830 children whose vaccination card was not seen at the first visit, 1094 had their card examined at the following visit and 53% (576/1094) had had BCG vaccination before the first visit. Hence, children whose card was not seen at the initial visit constitute a travelling group less likely to turn up at the following visit and with a lower BCG coverage (relative risk=0.82, 95% confidence interval 0.77 to 0.88). For the assessment of measles vaccine, 7357 children were alive at the second visit and examined at the third visit; 4230 (58%) had their vaccination card inspected, 3091 (42%) were absent, and 36 (0.5%) had lost the card or had missing information. The median age for measles vaccination was 10.6 months. Table 1 shows vaccine coverage at ages 0 and 18 months. We examined differences in background factors for vaccinated and unvaccinated children controlling for age and cluster (table 2). Vaccinated children had more contact with the health system, their mothers being more likely to have received tetanus vaccination during pregnancy and to have given birth outside the home. Vaccinated children had larger arm circumference and their mothers tended to be younger and have fewer children, to have a latrine in their compound, and not to belong to the Balanta or Pepel ethnic groups. Mortality for the 5274 children aged 0-6 months was lower in the group vaccinated with any vaccine compared with those not vaccinated, the mortality ratio being 0.74 (95% confidence interval 0.53 to 1.03). For children vaccinated with BCG the mortality ratio was 0.72 (0.54 to 0.96) (table 3, fig 1). The ratio became 0.55 (0.36 to 0.85) after age, diphtheria, tetanus, and pertussis vaccine, and cluster were adjusted for; estimates varied between 0.50 and 0.58 and were significant when background factors were controlled for. If we excluded children who were considered unvaccinated because they had no vaccination card, the mortality ratio for BCG vaccine among children who were seen was 0.33 (0.17 to 0.65). The effect of BCG was stronger when the analysis was restricted to infants aged 0 to 2 months, who would not receive measles vaccine during the next six months (mortality ratio 0.43 (0.25 to 0.75)). Since children weighing less than 2500 g are not supposed to receive BCG, unvaccinated children could represent a negatively selected group. After 31 days of age all children would presumably weigh more than 2500 g; we therefore analysed data on children aged 1 to 2 months who were either unvaccinated or vaccinated with BCG after 31 days of life. The protective effect of BCG was high in this subgroup (0.19 (0.04 to 0.95)). Children aged 7 to 13 months who had received measles vaccine at the second visit had a mortality ratio of 0.51 (0.30 to 0.85) compared with unvaccinated children (table 5; fig 3). The ratio was 0.48 (0.27 to 0.87) after age, BCG vaccination, and cluster were adjusted for and varied from 0.45 to 0.56 when background factors were controlled for, all estimates except one being significant. The estimate was unaffected by controls for other vaccinations. If we excluded children considered unvaccinated because they had no card, the mortality ratio for measles vaccine among children whose card was seen was 0.48 (0.27 to 0.87). The reduction in mortality was unrelated to measles deaths; 9 of 94 deaths in the unvaccinated and 1 of 19 deaths in the vaccinated groups were reported to be due to measles (table 5). When deaths from acute measles were excluded, the mortality ratio was 0.51 (0.28 to 0.95) for children vaccinated against measles compared with initially unvaccinated children. Many children, although classified as unvaccinated initially, received vaccination before the next visit. As information was unavailable for children who moved, died, or were travelling, these additional vaccinations could not be included in the survival analysis. To estimate the effect of BCG and diphtheria, tetanus, and pertussis or polio vaccination of initially unvaccinated children, we assessed mortality between the second and third visits for children vaccinated before or after the first visit; for measles vaccine we examined mortality between the third or fourth visits. Of 1168 children who had not received BCG vaccine at the first visit, 765 (65.5%) had received BCG at the second visit. There was no difference in mortality between those who received vaccine early or late (mortality ratio 1.36 (0.73 to 2.53) after age, diphtheria, tetanus, and pertussis vaccine, and cluster were adjusted for). Of 1082 children who had not received diphtheria, tetanus, and pertussis vaccine at the first visit, 772 (71.3% had received at least one dose at the second visit, with no difference between those who received vaccine early or late (1.10 (0.59 to 2.03)). Of 1371 children who had not received measles vaccine at the second visit, 864 (63.0%) had received measles vaccine at the third visit, with no difference in mortality between those who received the vaccine early or late (1.07 (0.40 to 2.87)). Infants whose mothers were not at home to show a vaccination card could constitute a special group in which vaccination had a different effect. We therefore examined whether the effect of measles vaccination on children absent at the first visit but seen at the second visit was different from that in other children. There was no such difference; the mortality ratio for measles vaccination compared with no measles vaccination was 0.39 (0.13 to 1.19) for children whose card had not been seen in the first round and 0.52 (0.27 to 0.99) for children whose vaccination card had been seen during the first round. In Guinea-Bissau, we found that BCG and measles vaccines were associated with better survival and diphtheria, tetanus, and pertussis and polio vaccines with higher mortality compared with no vaccination. The estimates are unlikely to be due to registration problems. The initial recruitment for the study was based on a random selection of clusters. The survival analysis had no loss to follow up, and the statistical model compared only vaccinated and unvaccinated children from the same community. We got information on vaccination status for around two thirds of the children, a high proportion given that the communities were not informed beforehand about the day of the visit. Furthermore, there was no indication that those not presenting a vaccination card reacted differently to the vaccines. Vaccines are appreciated by mothers in rural Guinea-Bissau, as shown by the high coverage for BCG and diphtheria, tetanus, and pertussis and polio (table 1), and there would seem no reason to fake vaccination dates on cards. However, some vaccinated children may have been registered as unvaccinated because a nurse forgot to note the date on the child's card or a guardian reported the child not having a card. Such misclassification would lessen rather than exaggerate the mortality differences presented here. For methodological reasons, our estimates may be conservative. For all vaccines, children vaccinated before the initial visit and those vaccinated later had the same mortality in the following period. Children who received vaccine after the first visit may have had their mortality changed to that of children who had been vaccinated at the first visit. This would reduce the mortality ratio for recipients versus non-recipients of vaccine. The effects we observed could be due to behavioural differences between mothers of vaccinated and unvaccinated children. Mothers of vaccinated children apparently had more frequent contact with the health care system (table 22). Having “concerned mothers” could possibly explain a beneficial effect associated with BCG and measles vaccines; however, the negative association with diphtheria, tetanus, and pertussis and polio vaccines is difficult to explain. Alternatively, sick children could be brought more often to health centres and therefore receive more vaccines. This seems unlikely as vaccine recipients had larger arm circumferences than unvaccinated children (table 2) and it would not explain the better survival of children who received BCG and measles vaccines. Do BCG and measles vaccines have a non-specific beneficial effect? The reduction in mortality after measles and BCG vaccination is larger than the proportion of deaths attributed to these diseases among infants and young children. As in previous studies,1 exclusion of measles deaths did not change the mortality ratio between vaccinated and unvaccinated children. A similar analysis could not be made for BCG since infant tuberculosis is poorly defined. Tuberculosis is estimated to have a much smaller effect on childhood mortality than measles.19 However, we found that the effect of BCG vaccine was as large as that of measles vaccine. It therefore seems implausible that the positive effect is merely due to BCG protecting against primary tuberculosis. The better survival of BCG recipients is unlikely to be related to non-vaccination of low birthweight infants because when we restricted the analysis to children vaccinated after 1 month of age the protective effect of BCG was strengthened. The effect of BCG was not due to early recipients constituting a group with better survival. Future studies should assess the extent to which the impact of BCG in childhood can be explained by prevention of tuberculosis. We need to determine the biological basis and magnitude of the non-targeted effects of different vaccines. Such effects will be seen only in developing countries with high mortality, where vaccine induced forms of immunostimulation could affect the response to other infections. 25 If BCG vaccine has beneficial effects, these should be considered when testing new, more specific vaccines against tuberculosis in the future. The use of a new vaccine could be associated with higher mortality, as was the case when the high titre measles vaccine was introduced.27 The combined effect of BCG and polio and diphtheria, pertussis, and tetanus vaccines was protective against childhood mortality (mortality ratio 0.74, 95% confidence interval 0.53 to 1.03). Should diphtheria, pertussis, and tetanus or polio vaccines be found out to have negative effects on mortality despite their protection against specific diseases, new vaccine formulations might improve the effect of the vaccination programme. Our observations emphasise the importance of immunisations in developing countries; vaccinated children had much lower mortality. However, it may be possible to obtain even better results. The current vaccination schedule, emphasising three early doses of diphtheria, tetanus, and pertussis and polio vaccine, is associated with low coverage for measles vaccine.1 A stronger emphasis on BCG and measles vaccines would contribute to lower mortality. Hence, changes in the vaccination schedules28 or type of vaccines used in developing countries could improve coverage and child survival. Contributors: IK supervised the last year of data collection and wrote the first draft of the paper. HJ supervised data control and carried out the statistical analyses. PA initiated the study, supervised data collection, carried out the first analyses, and wrote the final version of the paper. HJ and PA will act as guarantors. Funding Ministry of Public Health, Guinea-Bissau; Unicef, Guinea-Bissau; Danish Council for Development Research; Danish Medical Research Council; and European Union's science and technology for development programme (TS3*CT91*0002 and ERBIC 18 CT95*0011). Competing of interest None declared.
. Non-specific beneficial effect of measles immunisation: analysis of mortality studies from developing countries. BMJ 1995;311:481–485.
. Reduced childhood mortality following standard measles vaccination at 4-8 months compared with 9-11 months of age. BMJ 1993;307:1308–1311.
. The impact of measles vaccination upon childhood mortality in Matlab, Bangladesh. Bull WHO 1990;68:441–447.
. Child mortality related to seroconversion or lack of seroconversion after measles vaccination. Pediatr Infect Dis J 1989;8:197–200.
. A comparison of vaccine efficacy and mortality during routine use of high-titre Edmonston-Zagreb and Schwarz standard measles vaccines in rural Senegal. Trans R Soc Trop Med Hyg 1996;90:326–330.
. Protective effect of BCG against tuberculous meningitis and miliary tuberculosis: a meta-analysis. Int J Epidemiol 1993;22:1154–1158.
. Variation in protection by BCG: implications of and for heterologous immunity. Lancet 1995;346:1339–1345.
. Antibody response to accelerated immunisation with diphtheria, tetanus, and pertussis vaccine. Lancet 1993;342:203–205.
. The state of the world's children 1998. Oxford: Oxford University Press, 1998.
. Maternal mortality in Guinea-Bissau: the use of verbal autopsy in a multi-ethnic population. Int J Epidemiol 1999;28:70–76.
. Generalized linear models. 2nd ed. London: Chapman and Hall, 1989.
. Estimation of prevalence rate ratios from cross-sectional data. Int J Epidemiol 1995;24:1064–1065.
. Analysis of longitudinal data. New York: Oxford University Press, 1994.
. Poliomyelitis. In: Jamison DT, Mosley WH, Measham AR, Bodadilla JL eds. Disease control priorities in developing countries. New York: Oxford University Press, 1993:117–129.
. Pertussis: a worldwide problem. In: Brown F, Greco D, Mastrantonio P, Salmaso S, Wassilak S eds. Pertussis vaccine trials. Dev Biol Stand 1997;89:3–13.
. Childhood mortality among users and non-users of primary health care in a rural West African community. Int J Epidemiol 1991;20:474–479.
. Fatores de risco para morte por pneumonia em menores de um ano em uma região metropolitana do sudeste do Brasil. Un estudo tipo caso-controle. Rev Saúde Públ, São Paolo 1992;26:229–238.
. State of the world's vaccines and immunization. Geneva: WHO, 1996.
. Theoretical and methodological aspects of BCG vaccine from discovery of Calmette e Guerin to molecular biology. A review. Tuberc Lung Dis 1992;73:252–261.
. Surgery, recall antigens, immunity, and bacillus Calmette-Guerin vaccination. Am J Surg 1988;156:1–3.
. Intravesical bacillus Calmette-Guerin therapy prevents tumor progression and death from superficial bladder cancer: ten-year follow-up of a prospective randomized trial. J Clin Oncol 1995;13:1404–1408.
. Adjuvant bacillus Calmette-Guerin therapy in non-Hodgkin's malignant lymphomas: long-term results of a randomized trial in a single institution. J Clin Oncol 1990;8:608–614.
. Early BCG vaccination and reduction in atopy in Guinea-Bissau. Clin Exp Allergy 2000;30:644–650.
. Newborns develop a T helper 1 type response to BCG vaccination. J Immunol 1999;163:2249–2255.
. Adjuvant modulation of immune responses to tuberculosis subunit vaccines. Infect Immun 1997;65:623–629.
. 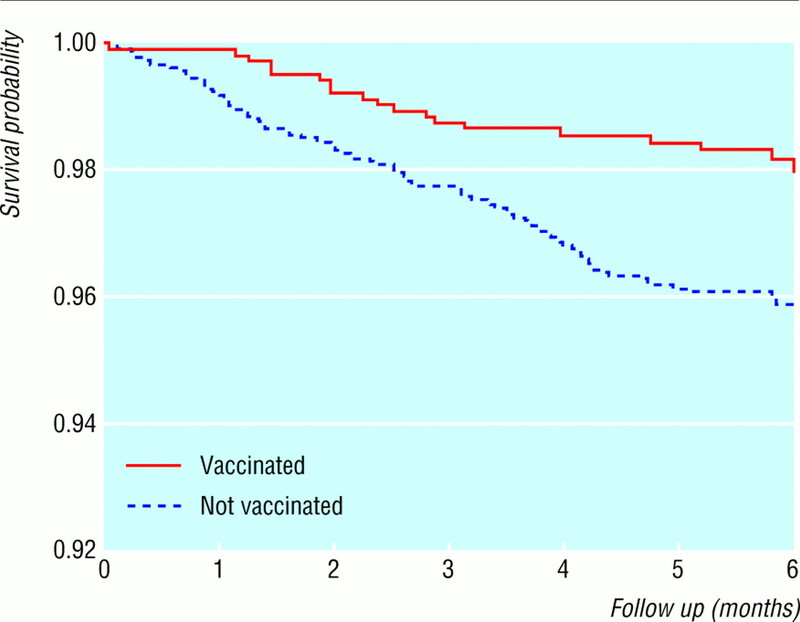 Long-term survival after Edmonston-Zagreb measles vaccination: increased female mortality. J Pediatr 1993;122:904–908.
. Early two-dose measles vaccination schedule in Guinea-Bissau: good protection and coverage in infancy. Int J Epidemiol 1999;28:347–352. The paper from Guinea Bissau in this issue, on routine vaccinations and child survival, may cause concern. An observational study undertaken under difficult circumstances, it reports three surprising trends: lower than expected mortality associated with BCG and with measles vaccines and higher than expected relative mortality associated with diphtheria-tetanus-pertussis(DTP)-polio vaccine, each of them just over the edge of conventional statistical significance. One should first question whether the results are valid. This is ostensibly a cohort study, following-up infants with different initial vaccination status, but the design and presentation are complicated. Of paramount importance is the comparability of the groups being compared. Vaccines are not distributed at random anywhere, and this may be particularly so in as disadvantaged a population as that in Guinea Bissau. The assignation of vaccination status in this study is not entirely clear, as written records were not available for a high proportion of infants and we are told of infants “who were declared to have received no vaccination.” Table 2 gives a breakdown of variables associated with vaccination status, and, not surprisingly, all vaccines appear to be associated with greater than average use of health services (mothers of vaccinated infants were 1.2 times more likely to have received tetanus vaccines than were mothers of non-vaccinated children). Might this explain the higher survival of recipients of BCG and measles vaccines? The table also shows that mothers of recipients of DTP-polio vaccine were younger than those of recipients of BCG or measles vaccines, though we do not know why. But we do know that high infant mortality is associated with low maternal age1: is it a coincidence that infants of these young mothers had a relative increase in mortality? The authors have adjusted for “background factors,” but exactly which factors were included is not clear, and, given the complexity of these trends, it is unlikely that the groups were fully comparable as a result. The numerical results are anomalous. In all the tables we see evidence of decreasing mortality with increasing age at start of follow up among the unvaccinated infants, as expected; but in both the BCG and DTP tables we see increasing mortality with age among infants who were vaccinated. This is contrary to expectation, and is not discussed. Such trends may reflect small numbers, but so may the overall associations of mortality with vaccination status, as the significance of each depends on a single or very few events. It is strange that the effect of DTP is associated with one dose but is not significant for two or three doses — which is not what we expect of a causal influence. The results thus fall short on three of the classic attributes of causality: gradient, strength, and coherence. Beyond the issue of validity, the paper is potentially misleading in its description of the apparent influence of DTP-polio vaccine. 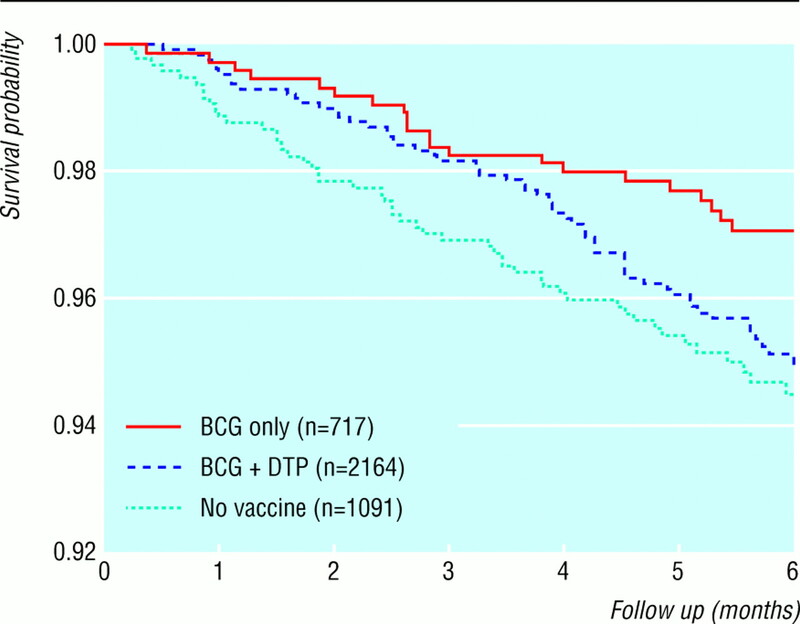 Given that DTP was tightly linked to prior BCG vaccination (only 19 infants received DTP without prior BCG), the effect of the DTP-polio vaccines could only be assessed against a background of BCG vaccination, and the observed result might better be described in terms of reducing the survival advantage associated with BCG vaccines than as increasing mortality (fig 2). This paper may raise questions about the standards of evidence appropriate for publication of unexpected versus coherent effects of interventions. The findings reported here are not convincing in themselves, though they would be important if true. There are thus many facets to this problem, and appropriate studies, carefully designed and analysed, and thoroughly presented, are needed.
. Mycobacterial dose defines the Th1/Th2 nature of the immune respose independently of whether immunization is administered by the intravenous, subcutaneous or intradermal route. Infect Immun 1998;66:5743–5750.
. Individual versus public priorities in the determination of optimal vaccination policies. Am J Epidemiol 1986;124:112–120.